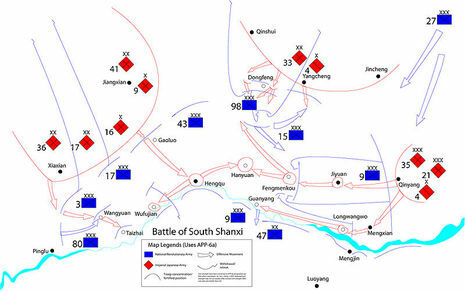 The Battle of South Shanxi (simplified Chinese: 晋南会战; traditional Chinese: 晉南會戰; pinyin: Jìn Nán Huìzhàn), also known as the Battle of Jinnan and as Chungyuan Operation by the Japanese, it was one of the 22 major engagements between the National Revolutionary Army and Imperial Japanese Army during the Second Sino-Japanese War. The country-side of Shanxi Province, however would remain mostly under control of communist guerilla's harrassing the Japanese Troups. Throughout the remainder of the Sino-Japanese War smaller and larger scale attacks would continue to disturb Japanese communications and transport, finally bogging them down on the Yellow River border with Shaanxi Province.